The Report is completed by Polish Geological Institute – National Research Institute (PGI), acting as a geological survey of Poland. It is a result of research conducted from October 2010 to February 2012. PGI acknowledges support of the U.S. Geological Survey, in particular training on shale gas resources assessment and common analysis of data from the Baltic – Podlasie – Lublin Basin. For the USGS the cooperation with PGI is a part of USGS global shale gas resources assessment, which covers also Poland. 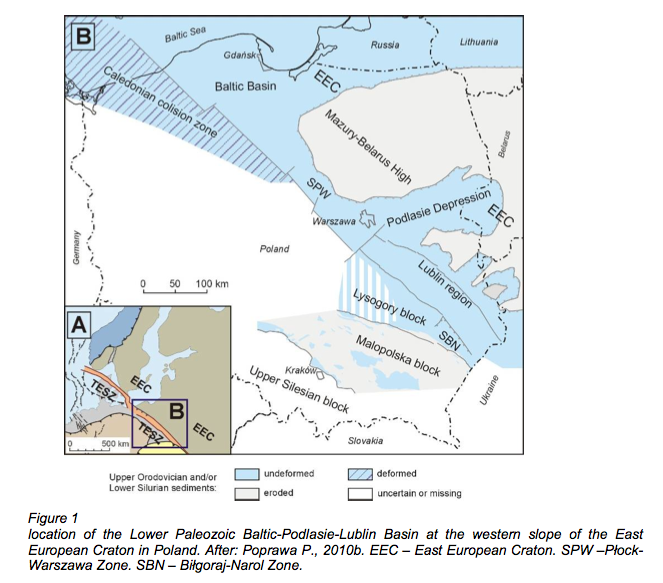 The Report is an attempt to estimate technically recoverable shale gas and shale oil resources for the Lower Paleozoic shale formation in the Baltic –Podlasie – Lublin Basin in Poland. The studied area extends form the Baltic offshore north of Słupsk and Wejherowo towns to the area of Hrubieszow and Tomaszow Lubelski towns, and covers some 65.000 km2. The Report does not cover conventional hydrocarbon resources of Poland, as well as other unconventional resources, such as tight gas or Coal Bed Methane. Other perspective regions of Poland, i.e. Lowers Silesia or Wielkopolska, are also not included. The current report might be regarded as a base line for further reevaluations and is based only on archive data collected for 39 key wells throughout years 1950-1990. As a new data from shale gas/oil exploration wells, drilled since 2010, will become available, the assessment shall be verified and new reports shall be issued every 2 years. For recoverable shale gas/oil resources assessment a broad range of geological, geochemical, geophysical and geomechanical data is required. For the analyzed basin some of key data are still not available. This refers to such data as porosity and permeability of shale reservoir, gas composition, reservoir pressure or initial production. For this reason the assessment is based partly on assumptions from the analogue basins, resulting with increase of the result’s error bars. As the analogues for the Baltic – Podlasie – Lublin Basin data from some of the US with well understood field characteristics were used. In this Report the recoverable resources were estimated with application of average Estimated Ultimate Recovery (EUR) for individual well, and average well drainage acreage, both adopted from US analogues. 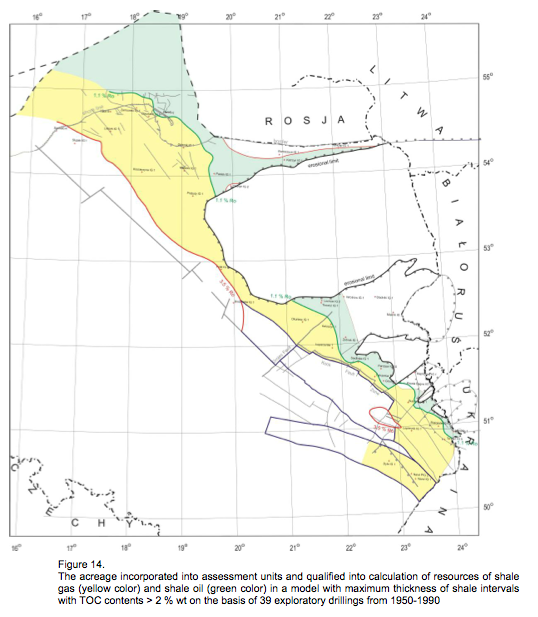 To qualify an individual archive well from the Baltic – Podlasie – Lublin Basin into acreage for which resources were calculated a criteria of net thickness at least of 15 m of shale formation with TOC at least 2 % wt was used, according to USGS procedures. These resources are therefore 2,5 to 5,5 times higher than documented conventional gas fields in Poland (145 Bcm). – 110 – 200 years of gas production in Poland at its current level with no changes in current proportion between domestic production and import. These resources are therefore 8,5 to 10,5 times higher than documented conventional fields in Poland (26 MMtons; 190 MMB). – 360 – 440 years of oil production in Poland at its current level with no changes in current proportions between domestic production and import.